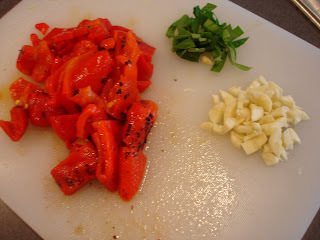 I don't even like red peppers that much so I have no idea why I was craving them today (No - I am NOT pregnant!). 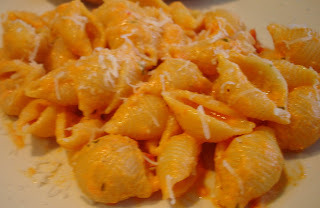 Tonight I made a roasted red pepper cream sauce with shells. I would have preferred penne, but Jon is very particular about his pasta shapes so we had to compromise... For just experimenting, it was good, but could use a little more of a punch so next time I'd add more garlic and red pepper flakes, and maybe some more cayenne. This may also be good with broccoli rabe in it. 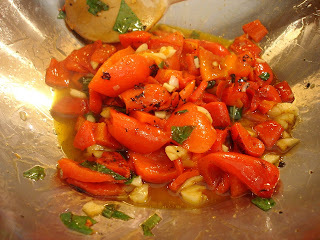 Chop the red peppers and cook in oil for with the garlic and chopped basil for 10 minutes. Put in a blender and puree until you reach your desired consistency. Return it to the pan and bring to a steady bubble. Stir in the half and half and cheese; add salt and pepper to taste. Once the cheese melts, add the butter and stir until melted. That looks awesome. I am defintely going to try this one!